How does a dirty, flea-infested, worm-ridden, and battle-scarred little street urchin get a chance to turn things around and live the good life? With an incredibly winning personality and the good fortune of befriending a couple of big-hearted people, that’s how. A neighborhood stray, Ratty Cat (pictured right), was becoming a regular visitor at Evelyn’s home. One day, Evelyn decided to bring in RC to see Dr. Alvarez for a checkup. The idea was to get RC cleaned up (i.e., purged of parasites) and neutered, then release him back into the streets to live out his life. (The cat is a lover, not a fighter by nature, but we’d fix it [pardon the pun] so he wouldn’t be adding little Ratty Cat Jrs. to the stray population in Etobicoke.) Evelyn’s own cat wasn’t as taken with the Ratmeister as she was, so adopting him herself wasn’t in the cards. But when Ratty Cat tested positive for FIV (Feline Immunodeficiency Virus, a.k.a. Feline AIDS), we faced a dilemma: unless someone were willing to give him a home, we had an ethical obligation to consider euthanizing him – not because FIV positive cats can’t enjoy many years of good health – they can and do – but because of the potential for Ratty Cat to pass on the disease to other outdoor cats should he find himself putting up his dukes in a street fight. Professionally, we’re obligated to look out for the greater good; but on a personal level, it’s a terrible position for any veterinarian to be in. Finding a home for FIV-positive adult stray cats is a hard sell at the best of times – so you can imagine our relief and gratitude when Patrick (pictured here) agreed to take him in. And with that, Ratty Cat was scheduled for surgery with me. Having him under a general anesthetic for his neuter presented an opportunity to step up his care and remove a few teeth that were either broken, loose, or infected. Good dental care is important for all cats – and especially so for those with a disease like FIV that suppresses the immune system and makes them more prone to infection. Now, if you’re worried that being “imprisoned” indoors after a carefree life on the outside is a fate worse than death, don’t be. This little guy is loving his new life; the room service is great, and the staff (er, his new family) is super nice. There are two fairly common viral diseases that we worry about in particular: FIV (Feline Immunodeficiency Virus) and FeLV (Feline Leukemia Virus). Neither can be passed on to people (or dogs), but both can spread from cat to cat, mainly through bite wounds in the case of FIV, and in the case of FeLV, with the exchange of body fluids through casual contact or fighting. Both diseases suppress a cat’s immune system; and both make cats more susceptible to infections and cancer. While neither is necessarily a death sentence, both are a life sentence (in other words, once infected, a cat remains infected for life). Testing for these diseases helps us control their spread and manage infected cats appropriately. 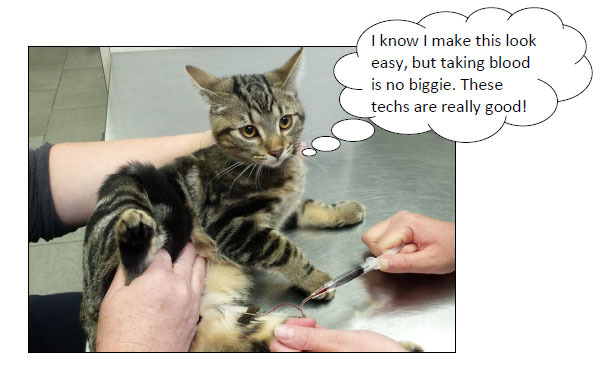 How do we test for FIV and FeLV? If your cat should test positive for FIV or FeLV on the screening test, and confirmatory testing is beyond your budget, our advice is to assume that your cat actually does have the disease, and to manage him/her accordingly. See My cat has FIV/FeLV, Now What? 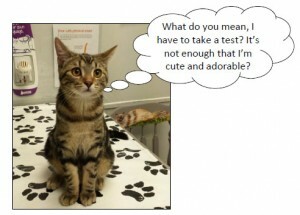 Should all cats be tested for FIV and FeLV? The wee things are especially susceptible to disease, and they can pick up FeLV from mom in utero, or through her milk. (FIV infection in kittens is uncommon, but it does happen.) If we’re going to make a dent in the number of cats that carry FIV or FeLV – a number that’s currently estimated in the millions! 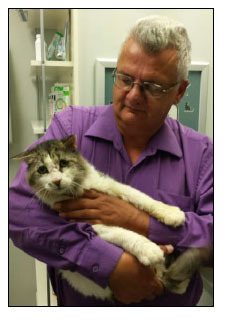 – we need to identify and isolate infected cats (i.e., keep them indoors). What better place to start than with kittens? 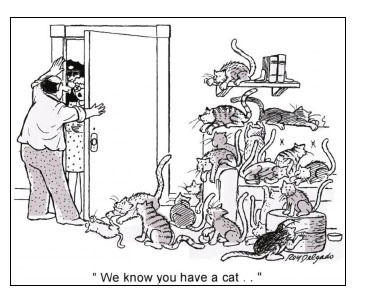 Any new cat that’s joining a household that contains other cats. Ideally, cats with FIV or FeLV shouldn’t be adopted into a household containing other cats. But if you do decide to keep a virus-positive cat, we can help protect your other cats by vaccinating them against these diseases. 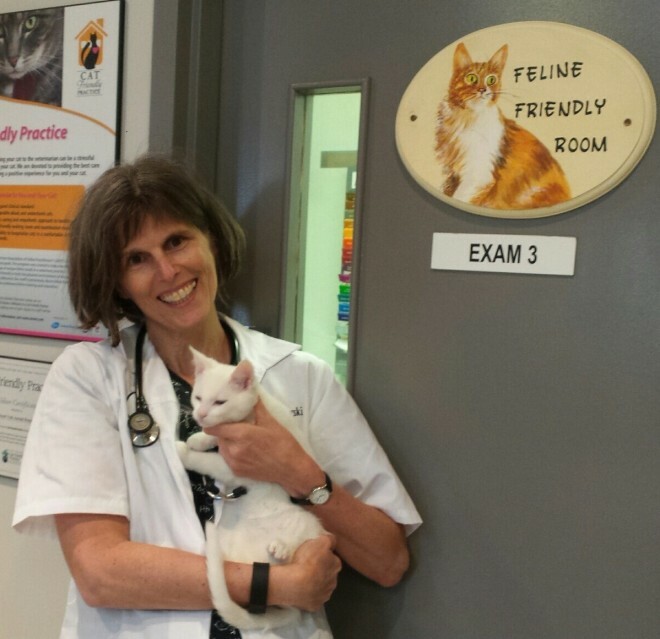 determine a cat’s prognosis; is it reasonably good, or pretty guarded? Any outdoor cat that’s been in a fight with a cat whose viral status is unknown. Because it can take up to 60 days after exposure for FIV to be detectable, we recommend that you bring in your cat for testing about two months after he/she has been involved in a fight with another cat (especially if he/she was bitten). Any cat that’s having FeLV or FIV vaccines added to its vaccination protocol. If that cat is already infected with FeLV or FIV, neither vaccine will offer any protection. Any feral cat that’s involved in a trap-neuter-release program. 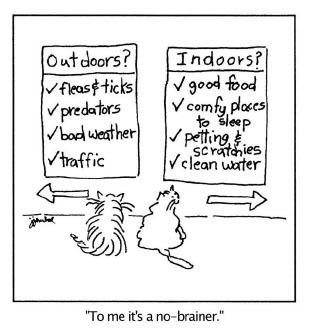 Before we can send a stray back to his/her ’hood, we need to make sure he/she isn’t going to infect other outdoor cats. When Ratty Cat tested positive for FIV on the screening test, we had to consider running a confirmatory test; and if that test had also come up positive, we would have been obligated to take the drastic step of euthanizing him to prevent spread of the disease. Lucky for RC, Patrick decided to adopt him regardless of his FIV status. Patrick chose to skip the confirmatory test and assume RC is FIV+ – and keep him indoors for the rest of his days. Should all cats be vaccinated against FIV & FeLV? The decision to vaccinate for FIV is more complicated, and we handle it on a case-by-case basis. 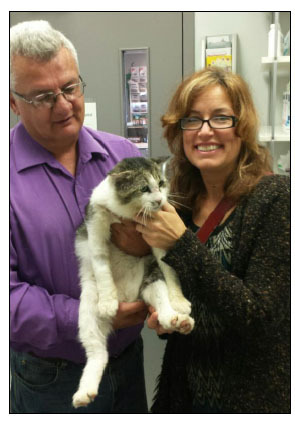 This article explains why: The FIV Vaccine – Why some Veterinarians Are Saying No for Now. My cat has FIV/FeLV; Now What? An FIV/FeLV+ cat that’s kept in the house will avoid spreading either disease to other unsuspecting outdoor felines; plus, he/she will be able to avoid infections of any kind which may further challenge an already-compromised immune system. It’s rough out there on the street! Cats fight; they skin their knees (that is, get hurt in all sorts of ways); and they pick up parasites. Best to avoid adding insult to injury. Stay on top of your cat’s health. And, of course, at the first sign of “something’s up with my cat,” hie thee to thy veterinarian right away. (If Shakespeare had a cat, he’d agree.) The sooner we step in, the more likely we are to pull your cat through whatever it is that’s up (or down).